The big rival to Snapchat in Asia could spell trouble. Snow is known for its popular animated face filter that is making this messaging app grow rapidly in popularity. Users across Asia, especially girls are in love with the pretty and cute things that Snow offers, said its spokesperson. Because of that, the messaging app gives it young users, who are predominantly female, a number of options to use with most tailored to the huge Asian market. This approach has helped to make Snow so highly successful across Asia that Snapchat might already be shut out of important markets within the region. That could turn into a concern for its investors. However, on Thursday no signals of any caution were seen when Snapchat’s parent Snap soared over 44% in its debut on the stock market giving the business a market valuation of close to $35 billion. Analysts flagged the slowing growth in users at Snapchat as a possible issue leading up to the listing, which since 2014 and Alibaba was the largest IPO in the tech industry. Asia, which accounts for over 60% of the world’s population, is a huge pool of possible new users. However, the messaging apps battle across the entire region is quite fierce and being the first into the market makes for a big advantage. Snow launched in September of 2015 in Asia, which is four years after Snapchat first became available across the U.S.
On industry analyst said that Snow served the market in Asia in ways Snapchat did not. The analyst continued by saying that while Snap has been busy with battle against Facebook and Instagram in the U.S., Snow was able to score impressive success in such markets as Japan, South Korea and of recent China. China is the key. Snapchat, Instagram and Facebook are banned in China. Thanks to traction in the most populous country in the world, Snow can attempt to tap into hundreds of millions of potential users that cannot access rival apps from the U.S. However, Snow must contend with the popular China homegrown apps like Meitu the platform specializing in photo sharing and WeChat the messaging giant. Snow did not shy away from following Snapchat’s lead. Some face filters are almost identical to those of Snapchat and its makes messages disappear. 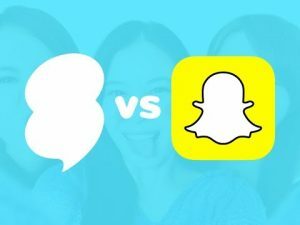 A research analyst said that the approach by Snow was to do whatever Snapchat does that is successful and do it times 100. For example, the analyst mentioned the different face filters. Snapchat limits the number of face filters available to its users depending upon the locations and date. Snow is pre-loaded with hundreds of different face filters.